LONDON — TV presenters just keep on giving. If they're not giggling like toddlers next to burning hashish or being photobombed by Usain Bolt, they're busted brushing their hair with the cameras rolling. Now one BBC Sport host has gone one step further. 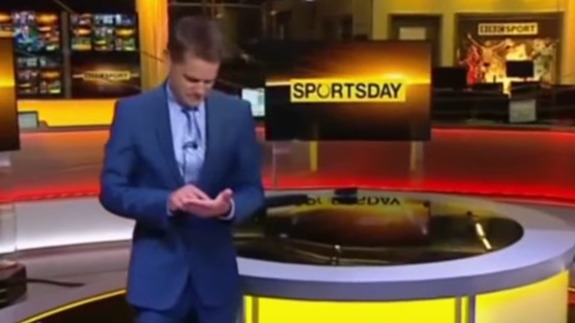 Chris Mitchell finished up a segment on BBC News Channel's Sportsday by tapping and swiping furiously on an imaginary iPad, unaware he was being filmed performing the bizarre ritual. He's been a good sport about it since, but next time it might be better to go back to shuffling papers.